What does milk have to do with religion? Let’s go to God’s country — where cows make milk — and find out. The sun shines on our hillside pasture, green and serene against the morning sky. Bells tinkle where the cows munch fresh grasses and drop their fertile compliments to the earth. Sometimes the cows team up to lick and nuzzle each other, or to tail-whisk the flies. Now ruminating with half-closed eyes, the cows look a little like sages themselves. Their meditation: making milk. Cows make milk from their blood. The blood carries the products of digestion and absorption to the udder, which changes the raw materials into milk components. To make fifty pounds of milk in a day, a cow must pump some ten tons of blood through her udder. That’s why all the grazing and cud-chewing. But exactly how that grass turns into milk is as mystical as life itself. Scientists say that the chemicals of life vary in their proportion and distribution from one species to another, and that a specific biochemical condition accounts for the cow’s producing milk. Twice daily our ruminating mystics enter the barn to let down their milk. Giving milk is a function of motherhood; kindly treatment helps the flow. And so our milkers sing to the cows as they go, handling each mother with care as they draw the sweet liquid from her body. From nature’s lab comes miraculous milk. Take it from the sages — cow’s milk is God-given nectar. It fortifies the body and develops the brain’s finer tissues as well. By filling us with goodness, milk clears the consciousness so we can consider higher, spiritual life. In ancient India, early in the morning at milking time, the sages would approach the dairymen for a pound or two of milk. The villagers would welcome these holy men, who would enlighten them with sublime, spiritual knowledge. Their inspiration: Lord Krsna, the Supreme Personality of Godhead. Consciousness is the symptom of the soul. Though we cannot see the soul inside the body, we can perceive its presence by consciousness. During the dawn milking, we can’t see the sun, but we can perceive its presence by the early light. Similarly, the presence of an individual consciousness illumining all living bodies — whether man or animal — indicates the presence of the soul. Each soul, though divine, displays different powers according to its bodily circumstance. The soul embodied as a cow, for instance, can turn grass into milk. And the soul embodied as a human being can turn his consciousness toward God. It’s natural to remember God in the country, whose beauty reflects His eternal kingdom. The Bhagavad-gita and other Vedic literatures describe the kingdom of God as a spiritual wonderland, where everything is possible in loving service to Krsna. The “desire trees” there yield any fruit upon request, and the surabhi cows, beyond the constraints of flesh and blood, give a limitless supply of milk. 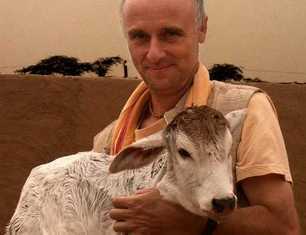 The Lord keeps many such cows, and in His transcendental form as a cowherd boy. He herds them. Sadly, though, the cries of the cows in the modern slaughterhouses mock the country’s reflection of Krsna’s peaceable kingdom. We’ve heard that “man is made in the image of God,” and so we hold human life sacred and religiously protect a person’s right to live. 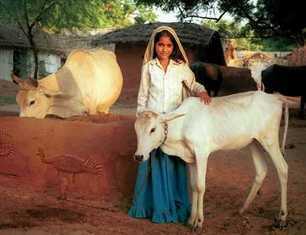 But the cow, made in the image of the Lord’s beloved surabhis, also protects us by supplying us nourishing milk. Shouldn’t we protect her, too? Srila Prabhupada comments, “By God’s grace, the innocent cow is simply eating grass and supplying the finest food, milk. The cow’s blood is very nutritious, but a civilized person uses it in the form of milk. 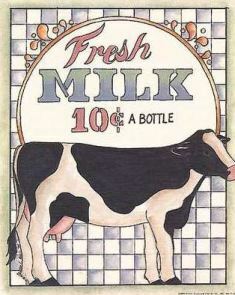 From milk, we can make so many things — yogurt, cheese, butter — and by combining these products with fruits, vegetables, and grains, we can make hundreds of wholesome preparations. That is civilized. Not spilling the cow’s blood in big slaughterhouses and eating her flesh. The message is clear. 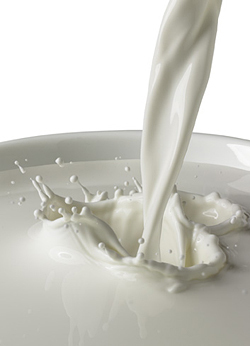 Milk — a product of the cow’s goodness — enriches human consciousness. Meat — a product of man’s ignorance — degrades it. That’s why meat-eaters, even if they drink milk, cannot understand the Supreme Personality of Godhead. So draw your nourishment from the cow, say the sages — not by spilling her blood, but by drinking her milk — and listen to the messages of Godhead. There’s a limit to the amount of milk you can drink, but there’s no limit to how much you can hear about Krsna. And the more you hear, the more you grow in spiritual understanding. Such is the milk of Krsna’s kindness. And that’s religion you can drink forever.